You've got places to be. ParkMobile will help get you there faster. Our free app makes it easy to find and pay for parking without running back to feed the meter. And you can reserve spots ahead of time for concerts and sporting events. 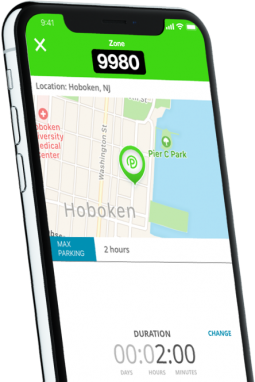 With more than a million spots and 3,000 locations across North America, ParkMobile gives you a smarter way to park when you're on the go. Whether you're looking for a spot in the moment or want to reserve a space ahead of time, ParkMobile puts the power in the palm of your hand. Park your car in an on- or off-street parking spot where ParkMobile is accepted. Look for a ParkMobile zone number on the signs around the meter. Enter that number into the app. Select the time you want to park and start the session. If you're running late, extend time in the app. Select 'Reserve Parking' in the ParkMobile app or site to find available lots in the area where you're going. Review full details on all the parking options in the area and select the lot that's right for you. Book your reservation, get your mobile pass or permit and head to the lot when it's time to park. We are the leader in smart parking and mobility solutions. We connect you with our audience of over 11 million people looking for parking every single day. Municipalities, universities, airports, stadium venues and other businesses use ParkMobile solutions to increase parking revenue, decrease operational costs and create happy customers. Contact us to learn how we can help your business. I have to give it to your company. I LOVE IT. If I need to extend my time, I do it on my iPhone, and not panic that I'm not home to add money to a machine. I just enter the zone, and it is done!!!! Also, in inclement weather, I am not out there on the street trying to figure out how much time to put on the meter... I just sit in my warm, dry car and put in the zone, the time, and I'm on my way. Fantastic application! I was able to pay seamlessly with the app on multiple occasions. I had to park in a parking garage a few days ago and I didn't have to waste time walking all the way across the other side of the parking garage to pay using a machine. This app is a must-have for all drivers. I've used this app in Atlanta, Dallas, Fort Worth, Denver, Boulder, and Philadelphia in the last couple of months. LOVE how easy it is to pay on the go and extend when needed. The parking reminder has save me $$$ in tickets multiple times! With an 11-month-old daughter in tow, this app made it incredibly easy to pay for parking without having to leave the warmth of my car in less time than it would have taken me at the kiosk. No matter where you want to park, ParkMobile is there. We're available in most major cities across the U.S.
Reserve your parking spot ahead of time at many of the top sports and entertainment venues around the country.